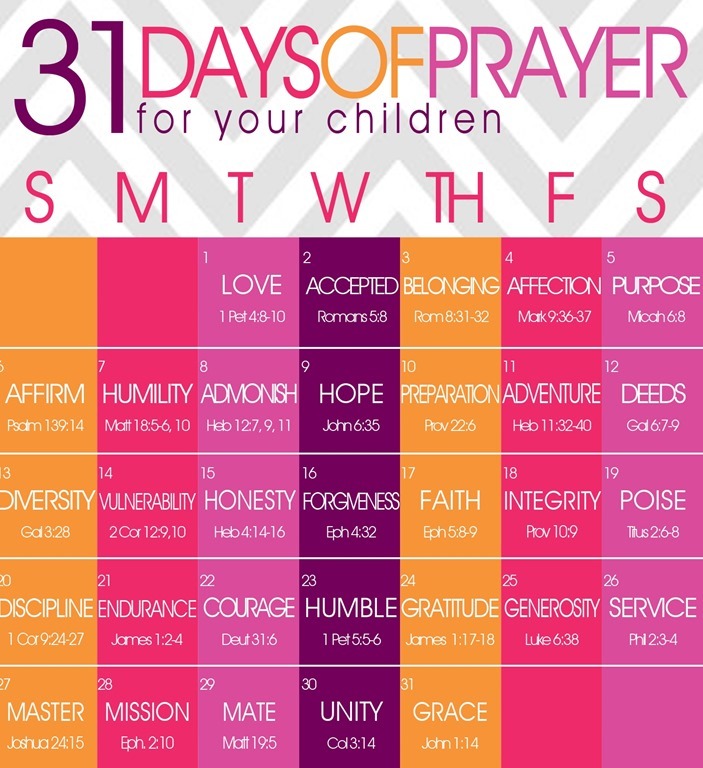 The Family Matters website just put out this fabulous calendar for 31 days of intentional prayer for your kids. I love it. We pray with our kids but I love that this is prayers FOR our kids. Prayers to God in hopes that our children will grow in the Word and as Christians. I know for me right now my biggest prayer for my kids is that they find God, that they understand the importance of giving their lives over to Him. I cannot wait for the day when the angels rejoice because my kids surrender themselves to the Lord. As it is only January 1st I have only done day one but it was such a powerful scripture that I want to say it over my kids everyday. I want to show my girls how amazing it is to use the gifts that God gives us to help others. To use what God gives us to shower others with God’s love and to show grace, just like He has shown to us. I am so excited to watch my girls grow in the Lord, and I not only pray for them, but I pray for Stefan and I as we teach them. I pray that people are put into their lives to build them up in the Lord. So start off 2013 by praying these scriptures over your children. I made the calendar my background on my computer so I would see it often and remember to do it. You can print it out and hang it somewhere or put it in your Bible. You can find the downloads here. So happy you’re joining us for our 31 Days of Prayer for Your Children challenge! Thanks for posting your thoughts. I absolutely LOVE this!!! I am going to be starting a few days behind, but I am going to start praying this over my girls. I am a new reader here on your page, but was reading your about me and we seem to have similar lives!!! I have two girls born in 2010 and 2012! And am working toward my bachelors in religion with a double minor in church ministries and christian counseling, and am recently toying around with the idea of getting ordained as a pastor in the Wesleyan church! Crazy the way that God leads us to things. Can’t wait to follow your journey! That is so fantastic. I love it. You should look me up on facebook, or I will look you up. I would love to connect more.